Diarrhea is a very common problem in animals associated with inflammation of the intestinal mucosa, varying degree of dehydration & acid base imbalance. Frequent fluid in faeces,Faeces with unpleasant odor, Altered appetite, Abdominal pain , restlessness & Dehydration. 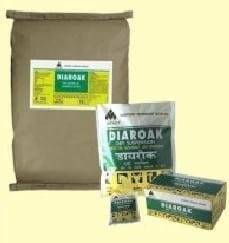 Diaroak is a scientific blend of herbal extracts that maintains and restores the Gastro-Intestinal (GI) functions thus preventing and arresting the episodes of diarrhea. To be administered twice daily. In severe cases repeat dose 6 hourly. Mix the granules with about five times quantity of water, shake well to homogeneous suspension and administer orally.